Malawi (former Nyasaland) became independent, and a member of the Commonwealth, in 1964, and a republic in 1966. 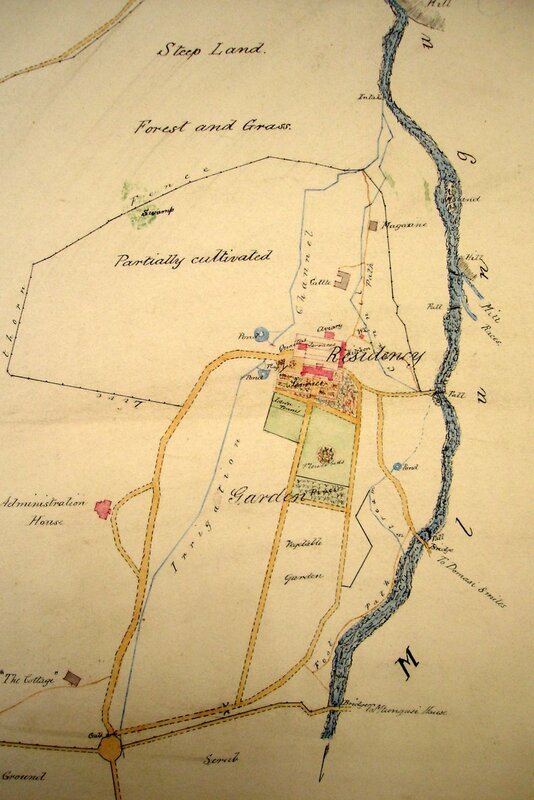 Its capital moved from Zomba to Blantyre upon independence, and to Lilongwe in 1974. The Property Services Agency built a relaxed single-storey house in 1975 for the deputy high commissioner on a 0.9 hectare site at Plot 10/351-3 into which the high commissioner moved pending the construction of a larger residence on Plot 10/8. Designs for this residence were produced in 1979 but never proceeded: instead, the deputy high commissioner’s house that was already being used as the residence was extended and became the permanent residence, which it remains. While Zomba was the capital, the high commissioner had a pied-à-terre in Blantyre, the commercial centre, at Hornby House, [aka Buckley House?] at No. 1 Nyambadwe Extension, bought on a 99-year lease from 1961. This house became the residence when the capital moved to Blantyre in 1964. The offices in the new capital were in the Old Federal Building, at 64-65 Victoria Avenue, bought in 1963. When Lilongwe became the capital in 1974, the Old Federal Building (in part by then sublet to the British Council) and Buckley House were used by the staff left at Blantyre: a junior staff house, called Lawson House, was also retained as a pied-à-terre for visiting staff from Lilongwe. The Post closed in 1985. 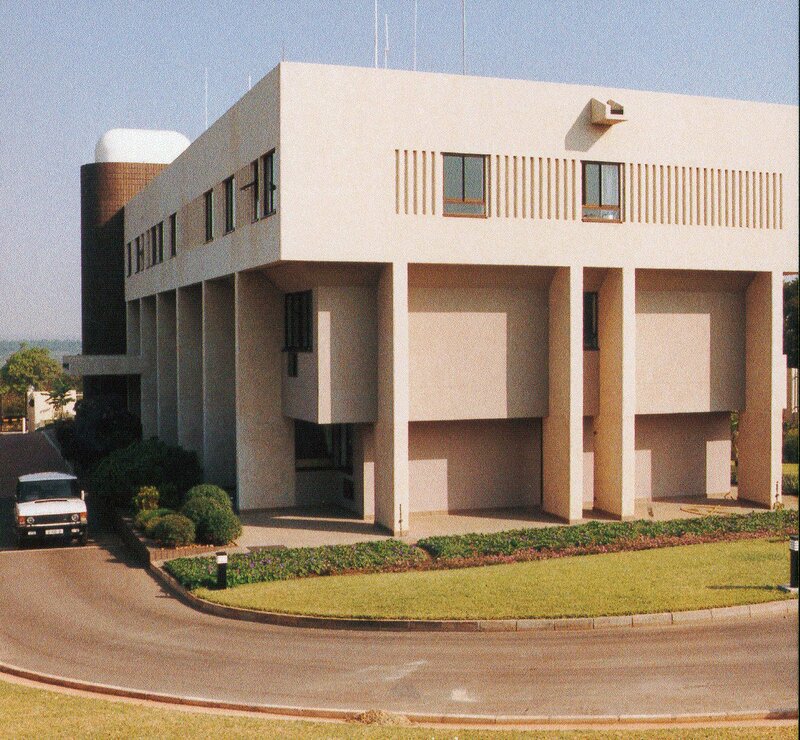 A consulate was first established in 1885, the year after the British South Africa Company applied for a charter to trade and six years before the British Protectorate of Nyasaland was established. A consulate, costing about £1,200, was built by Messrs Buchanan and Brothers, a local firm, in 1887 on one of the spurs that jut out from the south side of Mount Zomba. The designer of this rather charmingly-planned building is unknown, possibly the consul himself, Albert Hawes. The building, [somewhat extended?] became the residence of the Governor General soon after 1891, a government hostel in 1949, and is now still just recognisable as part of the Hotel Masongola. A consulate was left behind in Zomba when the high commission was established in Blantyre at independence in 1964. Long leases were bought on Plot 194, Mkulichi Road, for offices, 11 Malemia (former Salisbury) Road for residence, 6 Naisi Spur (formerly The Speakers House) for the deputy, and a dozen or more bungalows in the Mlungusi Estate Extension, [?Naisi Road]. 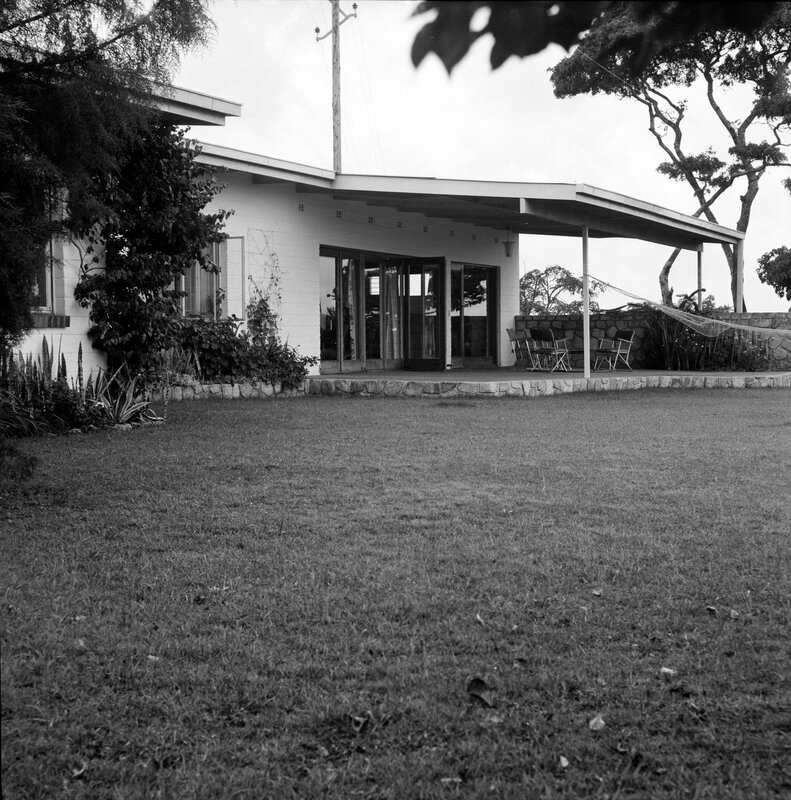 Garden view of Buckley House, 1968. Location plan of Zomba consulate, 1894. 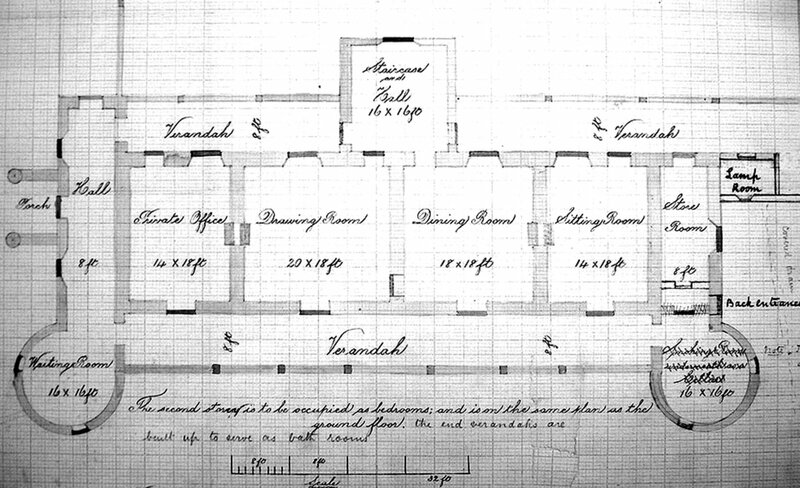 Ground floor plan of Zomba consulate, 1887.